Well, for most of us, starting a task is the easier part; finishing isn’t. Organizations face this problem too, for what are they other than groups of humans like us (machines are taking over, indeed, but we’ll not consider that for now.)? So, in order to improve efficiency and to get things done, a structured and cost-effective methodology is necessary. So the ‘structured, cost-effective methodology’ that we’ll look into here is Agile. The best way to approach any technical term is by first understanding what its plain-English meaning is, which is what we will apply here. 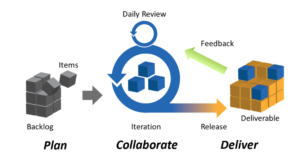 What does ‘agile’ mean in a broad sense? It refers to the ability to move or think swiftly and easily. The Agile methodology enables a team to do the same: to complete a task in a quality manner with ease, in a short time period. Initially formulated to aid software development, it is used in other sectors as well of late, as the benefits of Agile are numerous. We’ll come to the point now. Agile is a term used to describe a project management model that needs to be followed for satisfactory results. It consists of a set of basic guidelines that dictate how a certain task is to be carried out, with respect to product development. The crux of Agile is that work is carried out in a set of short development cycles (known as ‘sprints’) in an iterative fashion. In 2001, 17 software developers gave final shape to Agile, releasing four key values and twelve principles that encompass the essence of the methodology. Each point is pretty self-explanatory. In summary, it can be seen that they put an emphasis on flexibility and focusing on what really matters. The twelve principles take these ideas further. With the usage of Agile reaching sizeable amounts, you’ll need to know its pros and cons if you are planning to switch to it. Why choose Agile for your software testing and development? Read on to find out. The advantages of Agile are myriad. It improves flexibility, transparency, and productivity, while not compromising on quality. Since customers (and individuals in general) are held in high regard, it improves satisfaction in the product. 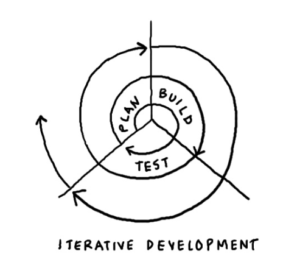 The Agile methodology encourages change, and such flexibility gives way to innovation. Usually, changes are not entertained after the start of a project in conventional models, as it is not cost effective and results in the wastage of work. But this problem does not arise in Agile as each step is iteratively worked upon before moving on to the next. In addition to being a lightweight strategy, Agile can enable the detection of flaws earlier on in the process, which is another way by which it reduces cost and manpower. It also widens the prospect of customer feedback, thereby further improving the chances of catching errors and UX disasters before lasting damage occur. Though, Agile is not a bundle of pure goodness either. Despite all the great pros, like any other set of guidelines, Agile works only in near-ideal conditions. For example, if the customer is not clear about what they want, or a team does not perform to its fullest, chances are that the benefits promised by Agile may not be reaped efficiently. Also, Agile best suits smaller teams and cannot be applied effectively for larger organizations which are more conventional or ‘traditional’ in their approach. Sometimes, the flexibility that Agile is based on may not work well when a more rigid approach is necessary. Do You Have What it Takes to Work With Agile? There are various basic skills that a professional working with Agile is expected to have. While these are very fundamental stuff, it doesn’t hurt to not overlook them as they are very essential. These are some of the main traits one is supposed to possess in order to use Agile to the fullest. Agile is not a standalone, rigid framework. Contrarily, it is comprised of various sub-models such as Scrum, Kanban, Lean, Crystal etc., each with its own principles, pros, and drawbacks. We’ll see here about the Scrum methodology, as it is one of the most widely used in the pool. According to VersionOne, about 58% of organizations that have adopted Agile work with Scrum. In this methodology, the stakeholders are divided into three categories: Scrum master, product owner, the Scrum team members. The Scrum master is expected to get in touch with the team once a day or so to keep tabs on their work, while the product owner is expected to create a project backlog, which is a to-do list of sorts. It is up to the team members to choose tasks from the backlog or decide in which order they must be executed. Work is completed within short ‘sprints’ that last around 2-4 weeks, and reviews are held at the end of each sprint. This repeated until the entire backlog is completed. There are a lot of online certifications and courses that can help one getting started with Agile or any of its subsidiary methodologies. There is also project management software such as Agilean, SprintGround, and VersionOne which give a structure to the strategy, as well as have customizable templates that can be tailored to suit your needs. Even Microsoft has a set of tools such as an Agile glossary, Agile process guide, Scrum process work item types, and workflow, to quote a few. Does your organization work with Agile or Scrum? What is your experience in connection to it? Let us know in the comments below! Do you want to have a practical approach to it? Contact us to have your queries answered today! !